Susan Wise Bauer has come up with some great products, and Writing With Ease ranks right up there with all her other classics. I've always been a fan of narration, but could never get my children to understand how to do it. This book has helped me help my youngest child get a grip on how to narrate back to me. There are lots of other good points about this program. Narration is just the first feature that I thought to mention. Whether you choose the parent book or the student book, they both include good literature passages with good comprehension questions and dictation passages. The parent book called Writing With Ease Strong Fundamentals is a hard cover book that introduces the writing concepts taught in the program along with instruction for levels 1 through 4. 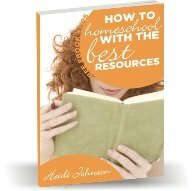 Although it is possible to just use this book, if you are just starting with homeschooling or are not sure how to teach writing, I would suggest that you also get the student workbook that goes along with the level that your child needs. The student workbook contains all the passages and writing pages in one place. This book makes the writing process even easier for parents to implement because much of the work is already done for them. If you are a parent who likes to have a little bit of guidance, and then like to do your own thing, then maybe just the Strong Fundamentals book would be enough for you. Is Writing with Ease for you? These books teach writing in a way that I have never seen before. The style and work is not too overwhelming, yet it provides enough instruction for the parent to feel that the students are making some progress. This series coincides well with the First Language Lessons books that Susan Wise Bauer also wrote. We loved the book because my son enjoyed the oral work. I liked the fact that he was still learning and he liked the fact that he didn't have to do any writing on paper. I like so many of the books that Susan Wise Bauer has written like theStory of the World series, First Language Lessons, and the Well Trained Mind. Many parents are saying that they wished that Writing With Ease had been around when they were teaching their older children. I am certainly one of those parents too. You can view all 4 levels of workbooks and parent book here.